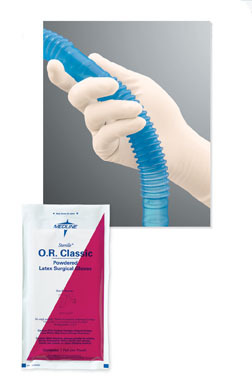 GloveSaver.com - Powdered Latex Surgical Gloves - because of their design these gloves have become the standard in many O.R.s. Their anatomical shape makes them fit better, expecially for in-between sizes. Curved fingers reduce hand fatigue while the beaded cuffs prevent roll-back and make gloves easy to put on.